2017 was the fifth year I blogged. Given how many blogs don’t make it past five weeks, I’m pretty happy I’ve made it this far. At this point, I don’t see myself stopping. As I’ve mentioned in the past, you need a reason other than traffic, fame, or money to keep you motivated to blog. I do it for other reasons, which you can read about here. You can also see my prior blog reviews by clicking on the years – 2016, 2015, 2014, 2013. Overall, 2017 wasn’t my best effort. I fell way behind on my book reviews and have 14 pending at the time of this writing. I had two months this past year, April and May, with zero posts. As I’ve mentioned in the past, it’s not a lack of ideas holding me back. I have almost 90 post ideas in my queue, not to mention a whole category of posts on startups that pushes the total to somewhere between 110 and 120. With all that said, I intend to soldier on. My goal remains to hit the elusive 100 posts for the year, which will once again be my goal for 2018. Before we look too far into the future, let’s start by taking look at the past. In 2017, I passed a significant milestone for my blog – 100K visits since inception. 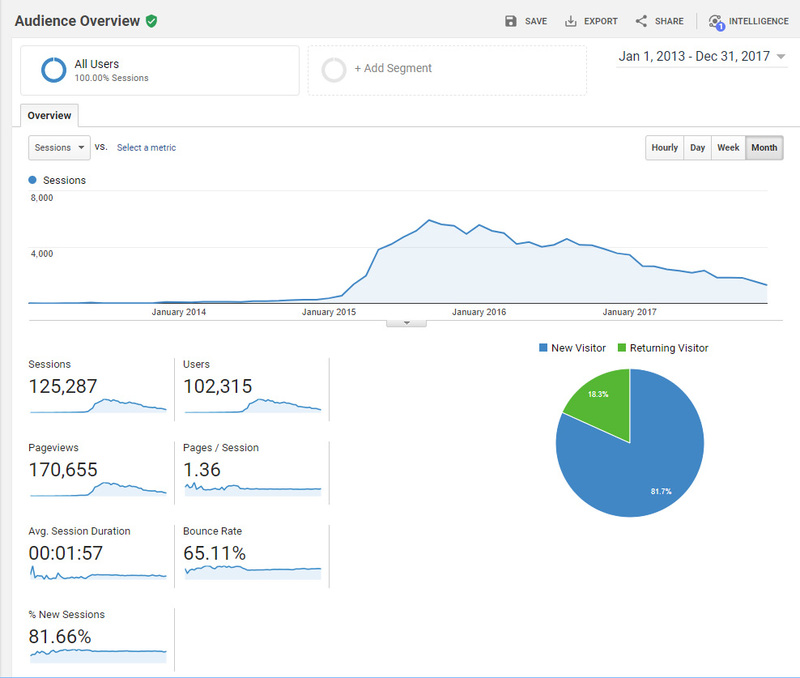 I finished the 5-year period starting in 2013 with just over 125K visits. It’s a bit surprising as I don’t focus on on traffic generation, as I mentioned above. The traffic pattern is interesting because you see that traffic was minimal until 2015. The traffic profile changed on a post I wrote about installing DD-WRT onto the TP-LINK WR841 router. Over the lifetime of the site, that post accounts for nearly 75% of the traffic to the site. What’s also quite interesting is that the traffic peaked near the end of 2015 and has been in steady decline since. It shows that technology posts peak while they are still relevant, and then slowly die off over time. I expect traffic to continue its decline during 2018, unless I am able to stumble upon another home run post. 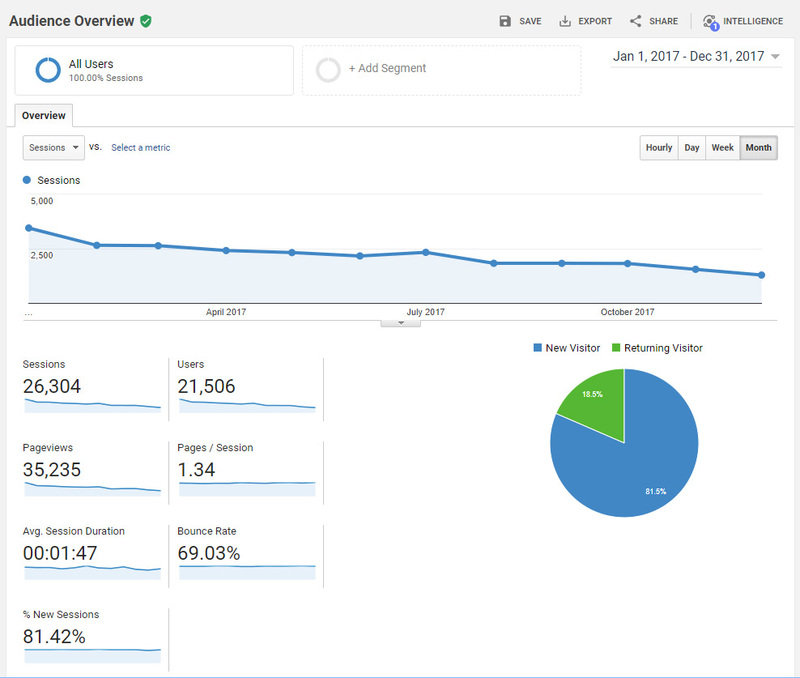 As I did last year, here is my monthly traffic profile for 2017. 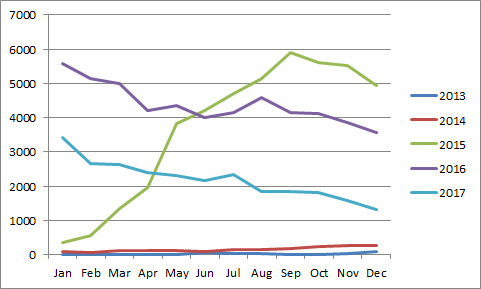 And perhaps more interesting, here are the monthly numbers for the last five years. You can see that traffic peaked in September 2015. It has been in decline ever since. I’m not worried about it. It’s just interesting to see the dynamic and how one post affects traffic. As usual, my goal for 2017 was to generate 100 posts to the blog, which is the equivalent of ~2 per week. I was even going to call it a win if I got to 75. Well, I got halfway there, to the lesser of my two goals. 36 is too small of a number. I’m going to put forth a much better effort in 2018. As usual, the year started off great. I had 12 posts in the books by the end of February. Unfortunately, zero post for the months of April and May was followed by 7 posts July through October. Pretty clear that I need to adjust priorities if I intend to hit my goals. It’s always fun to see which posts are drawing the most traffic. I like to break it down into three categories. There’s the traffic to the most popular posts published in 2017. Then there are the popular posts for the year of 2017. Finally, there are the most popular posts since the inception of the blog. There’s not a lot of difference in the last two lists. It’s the first list that tends to be the most interesting. 2017 wasn’t a good for year for hitting blog goals, but let’s check anyway. Well, since I didn’t even get to one per week, this was a fail. Hmmm. I fell even further behind. 0 for 2 so far, and not looking good…. 0 for 3 and counting. I really wish I could have done more here, but it was another swing and a miss. I’m not going to beat myself up over the missed goals, although I would like to do better. So let’s move on from last year, and look ahead to 2018. Given how tough 2017 was, I should make more conservative goals for 2018. However, since this is something I do for fun, I’m going to set the bar high. It will be great if I’m able to get there, but even if I don’t, just being consistent for the whole year will be a win. One of these years I’ll do it. I’m going to stick to my goal of 2 posts per week. I need to get caught up on my book reviews. I’m behind a lot, so this goal will be a challenge for next year. I’d love to share more of my experience running my own business. I have a long list of posts that I hope to make a dent in during 2018. As I mentioned last year, I’d really like to start a section on motivational and inspirational quotes, reading, books, and observations on life. Maybe 2018 will be the year. It would be nice to freshen up the site design. It’s not high on my list, but it would be a fun project to take on. While I didn’t do a good job according to my goals, finishing another year makes the blog a success. I’m going to continue to press on. Just continuing through 2018 will be a major accomplishment, and if I can get through a couple of goals, it will be icing on the cake! This entry was posted in Life Journal on February 5, 2018 by Gregg Borodaty.